The alleged teen gunman who shot two young students and a teacher at a South Carolina elementary school had a penchant for firearms. A family friend told CBS News the 14-year-old boy had home-schooled after being suspended for bringing a weapon to school within the past two years. Police said the unnamed suspect began his shooting spree by gunning down his father, 47-year-old Jeffrey Dewitt Osborne, at their family’s home. He then made an emotional and unintelligible phone call to his grandparents at 1:44 p.m. The phone call prompted his grandparents to visit the home, where they discovered their son’s body and their grandson gone. At 1:45 p.m., a teacher called to report the shooting at the school. Within seven minutes, authorities descended on the building in search of the suspect, who was described as being a blonde white male wearing black. Two six-year-old students were wounded—one in the leg and the other in the foot—and first-grade teacher Meghan Hollingsworth was shot in the shoulder. One of the injured students and Hollingsworth were released from the hospital on Wednesday. The other injured boy, Jacob Hall, was airlifted to Greenville Memorial Hospital and is in critical condition after he was shot through his femoral artery. The Hall family issued a statement thanking emergency responders for their efforts. A GoFundMe page has been set up to financially support the family as they tend to Jacob. Police said the shooting occurred on the playground and the gunman never entered the school building. Jamie Brock, a 30-year veteran volunteer firefighter subdued the shooter and held him down until police arrived. Sheriff John Skipper praised Brock’s quick-thinking actions which perhaps saved more lives. Officials said the school’s active shooter drills also prevented more bloodshed from occurring. There is no known relationship between the victims and the suspect. “The shooter is a juvenile, he’s a white male. There’s no racial undertones there. There’s no terrorism involved,” said Anderson County Sheriff Deputy Chief Keith Smith. The harrowing events were over within an hour, officials said. 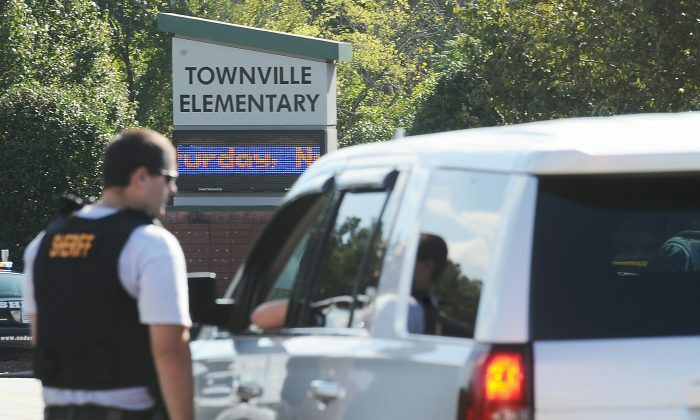 Classes were canceled at Townville Elementary for the rest of the week and counseling services were made available.